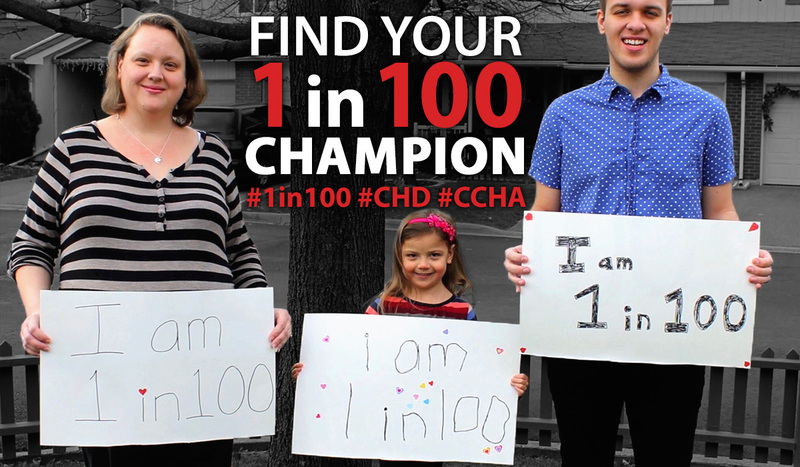 CCHA is challenging you to find your 1 in 100 Champion! Share your video, picture or story of your 1 in 100 Champion on social media to help raise awareness for Congenital Heart Disease #CHD. Tag us in your post @cchaforlife on Facebook, Twitter or Instagram using the hashtags #1in100, #CHD, #CCHA. Not on social media - no problem. You can still share your 1 in 100 Champion video, picture or story by emailing them to us at communications@cchaforlife.org using 1 in 100 Champion in the subject line. By sharing your 1in100 Champion story with us during Heart month, you will help raise awareness for Congenital Heart Disease #CHD. Show your support for the over 250,000 Canadians living with CHD!